Bashar Al Assad - Who is Bashar Al-Assad? Syrian President Bashar Al Assad represents stability and continuity after the 30-year rule of his father Hafez Al-Assad. Who is President Bashar Al-Assad of Syria? Bashar’s life has changed dramatically after the accidental death of his elder brother Bassel in 1994, who was expected to take office after his father. Dr. Bashar Al-Assad was born in Damascus, Syria, on 11 September 1965. He studied ophthalmology at the Tishrin military hospital in Damascus from year 1988 to 1992, and then he traveled to London to resume his studies as an eye doctor. After Bassel’s death, Dr. Bashar Al-Assad was recalled from London to take over his job as commander of the Syrian army's armored division. He used his new post to remove many old officers, and possible enemies. In 1994 Dr. Bashar Al-Assad entered the Homs Military Academy. In January, 1999, he rose through the ranks of the Syrian Army to become a Colonel. After being appointed as a colonel of the Syrian army, Bashar Al Assad became more involved in state affairs. On several occasions he was sent as a personal representative of President Hafiz Al Assad for discussions with other presidents like Lebanese President, Emile Lahoud, and French President, Jacques Chirac. This process was stepped up after the sudden death of his father on 10 June 2000. In the last years of his father's life, Dr. Bashar emerged as an advocate of modernization and the internet. He was also in charge of a domestic anti-corruption drive. Currently, President Bashar Al Assad is also the President and Chairman of the Syrian Computer Society, which aims at promoting and improving Information Technology in Syria. After the death of President Hafez Al Assad, public support for Dr. Bashar has been very positive. Also the different political parties in Syria have expressed their support to Dr. Bashar. As a result, the Syrian Parliament has unanimously approved the nomination of Dr. Bashar, to become the 16th President of the Syrian Arab Republic. According to government sources, this succession to the Syrian presidency was seen as "the best guarantee for the pursuit of the President's [Hafez Al-Assad] policy and the maintenance of stability in Syria". 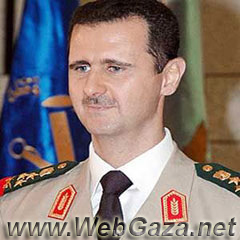 Dr. Bashar Al-Assad has also been named Secretary General of the Baath Party and Commander in Chief of the Armed Forces. The Parliament, on 25 June, nominated him for the presidency, and this vote was backed by a referendum held on 10 June 2000 for a seven-year mandate. However, Bashar Al-Assad is the politician who got into power much against his own will. If his brother was alive, he would have almost certainly stayed away from outside politics and far from the spotlight. Though he is a close follower of his father's steps, Bashar differs from him in terms of his approach to politics and his framework. Since taking office in June 2000, President Assad has freed hundreds of political detainees and allowed the first independent newspapers for more than three decades to start publishing. President Assad has made clear that his priority is economic rather than political reform. Syria's once-closed economy is opening slowly. There are plans for private banks for the first time in decades. Some observers say that Dr. Bashar is firmly in the driving seat, but that he is moving slowly in order to keep powerful institutions behind him and to try to ensure stability. Current events in the Middle East have put President Bashar Al-Assad under mounting pressure. The United States war in Iraq and its attempt to remodel the Middle East has cast Damascus on the wrong side of the fence. U.S. officials have accused Syria of sheltering top Iraqi officials, allowing Iraq's weapons of mass destruction to be hidden away on its territory and transferring military equipment to Iraq. Syria has also been called a rogue state by U.S. officials and was accused of developing chemical weapons. Damascus has denied all the allegations. Also Libya’s recent announcement that it will abandon its weapons of mass destruction and Iran's decision to co-operate with the International Atomic Energy Agency have intensified the pressure. Dr. Assad's response to all this has been to try to insulate himself against the escalating pressure. He has sought to improve relations with Egypt and Turkey, and has called for peace talks with the Israel on the occupied Golan Heights. While Bashar’s vocal opposition to the U.S. war in Iraq has incited American anger, it has been popular in Syria and in the region. Domestically, Bashar Al-Assad has represented the hopes of fundamental political and economic reform.